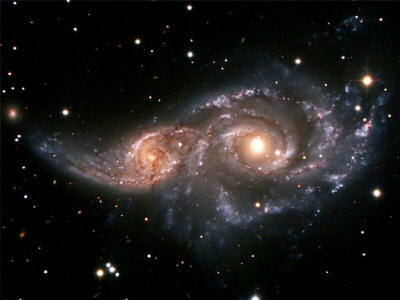 "Merging galaxies" NGC 2207 and IC 2163. 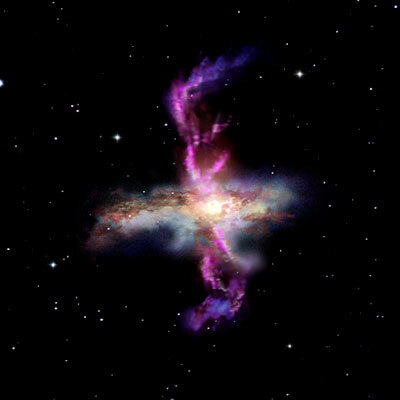 According to a recent press release, The European Space Agency’s orbiting telescope Herschel has observed “molecular gas gusting at high velocities” from galaxies (below image) that appear to be merging. In some instances, the gas is being driven to velocities exceeding 1000 kilometers per second. Traveling at that speed, the United States is about fives seconds across from coast to coast. As the announcement goes on to state, “powerful, storm-like processes” are taking place. with outflows of molecular gas. These storms are said to be initiated by the black holes within each galaxy as the two come together. Another theory is that supernova explosions take place that are sufficient to blow away almost the entire volume of gas in a galaxy. Star formation, with its assumed attendant high frequency radiation, creating the blasts of galactic energy is another. From gamma rays down through X-rays and extreme ultraviolet, conventional theories have relied on gravity and acceleration for radiation to be produced in space. Compressing hydrogen gas and dust is supposed to create enough transfer of momentum that the gas reaches million degree temperatures. It is the high temperature of the gas that is supposed to make it glow so brightly. The winds are so powerful that the collision of the wave fronts is thought to be generating X-rays where the shells intersect. as electrons bounce back and forth in the magnetic fields they accelerate until they impact low-frequency photons, imparting so much energy that they become X-rays. Electric currents surge out along galactic spin axes, forming double layers that can sometimes be seen as radio or X-ray “lobes.” The currents spread out around the galactic circumference, flowing back to the core along the spiral arms. All the elements in a galactic circuit radiate energy. That energetic radiance shows that they are powered by larger circuits. It seems apparent that we will never be able to observe them, since they are far too large and diffuse. Plasma’s behavior is governed by those circuits. Double layers with large potential voltages between them often exist. The electric forces in double layer filaments can be much stronger than gravity. Those filaments can also have different temperatures or densities. Double layers broadcast radio waves over a wide range of frequencies. They can sort galactic gas and dust and then condense it. Most significant to the ESA bulletin, they can accelerate charged particles to cosmic ray energies. This vision of the cosmos sees various components coupled to and driven by circuits at ever larger scales. Electrons and other charged particles accelerating through intense electric fields radiate “shouts” of energy in many bandwidths. The power of those currents can sweep up neutral gas and dust as they move through a galaxy.